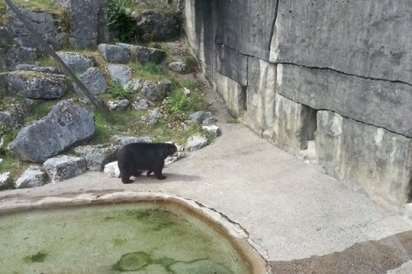 In this write-up the environmental enrichment issues of two species housed at the Belfast Zoological Gardens will be discussed. Environmental enrichment can be defined as the development of stimulating settings for animals within a zoo as a means for them to demonstrate species-typical behaviour such as exercising control or choice (Shepherdson, 1998). The two species in this piece being investigated are that of the Andean (spectacled) bear and the Asian elephant. Environmental Enrichment has often been described as a vital role to the daily care and integration of a species. The process of enrichment techniques can divide into two broad categories; inanimate enrichment and animate enrichment. Inanimate enrichment includes subdivisions such as novel objects, exhibit design, visual, auditory and olfaction stimulation. Animate enrichment includes training, research and interactions with humans and other animals. The two broad categories of environmental enrichment are essential as a means to enhance naturalistic actions from a species kept in captivity, for example, exhibit design needs to provide varying substrates and complexities rather than just being aesthetically pleasing. Nevertheless, it has been discussed that animal captivity has a negative effect on a species independent behavioural traits (Reference) and that environmental enrichment settings do not encourage the same behaviours as those found in the wild. Zoo habitats are more static in general compared to the wild as food, shelter, safety and medical care are all provided. Most problems which occur in captivity can be caused by a lack of stimulation and even the best kept zoos can have animals who suffer with psychological discontent (Jordan, 2005). Carlstead and Shepherdson, (1994) have suggested that prolonged exposure to an environment which has low levels of stimulation can cause an animal to become aggressive, lethargic and be slower to habituate in its new surroundings. Jordan (2005) has suggested that many animals can suffer from stress in captivity which can be shown in their behavioural responses such as pacing, regurgitation, excessive grooming and rocking. These types of behaviours are repetitive patterns and are referred to as stereotypic behaviours. Scientists have suggested that these repetitive behaviours may in some cases be an animals’ way of providing novelty to an environment lacking in stimulation. Belfast Zoological Gardens currently houses ‘BLAH’ Asian elephants, who have an important role in the zoos conservation projects. The Asian elephant is a species located in Southeast Asian countries such as Sir Lanka, Thailand and Vietnam (References). It is smaller than its African cousin and considered an endangered species. 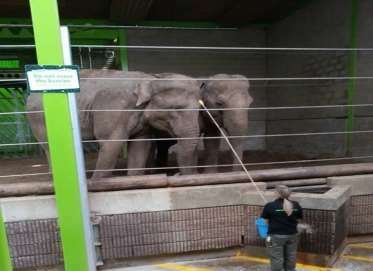 In the Belfast Zoological Gardens, the staff members try to ensure the Asian elephants have a stimulating environment by adding novel items such as tyres and puzzle devices into the elephant’s enclosure. By the Belfast zoo having novel objects such as the tires, it encourages the Asian elephants to demonstrate species typical behaviours as the elephants have choice and control with objects thus providing active stimulation. 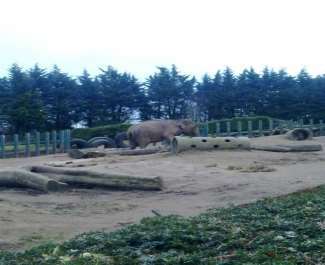 Additionally Belfast zoo incorporates other enrichment amenities such as having mud and rubbing posts in varying sizes. However, it has been noted that enrichment amenities should be rotated such as logs, balls and tires as a means to sustain stimulation for the elephants . Asian elephants typically spend up to 16 hours per day foraging for food in the wild, eating herbs, leaves, bark, roots, fruits and flowers (Stoinski, et al. 2000). Elephants food diets in captivity tends to offer less variety than in the wild and by a zoo adding new food elements to their diet it can be considered a method of enrichment. At Belfast Zoological Gardens, keepers place food in trees, in food containing devices and in blocks of ice as a means to add stimulation for their Asian elephants. It has been suggested that more complex enrichment methods such as the food containing devices, can involve teamwork which allows the animals to demonstrate more species-typical behaviours. Desmond and Laule (1998) and Mellen and Sevenich (1999) have noted that when animals have been given a choice of their food, they would prefer to work for it rather than be presented with it. Therefore, training enrichment provides one of the most complex learning devices for species. Additionally, Belfast Zoo spatially provides food which can be found in irregular locations. Research has suggested that the Asian elephant strongly relies on its sense of smell in contexts such as foraging for food (Santiapillai and Read, 2010) or in social communication (Langbauer, 2000; Rasmussen & Krishnamurthy, 2000; Scott & Rasmussen, 2005). Rasmussen (1999) and Langbauer, (2000) noted that the Asian elephant’s long-term stability is dependent on the effectiveness of its intraspecific communicational skills within its herd. The Belfast Zoological Gardens tries to ensure the species at their zoo such as the Asian elephant are in group sizes which they would be used to in the wild as a means to facilitate species-typical behaviours and communicational vocalisation. Visually the Belfast Zoo also places animals such as zebras and giraffes next to the elephant enclosure as they are often found near each other in the wild. It has been suggested that the visual stimuli of species can increase stimulation for the Asian elephant and have a calming effect on its behaviour . The shape and the size of an animal’s enclosure are equally important for creating a stimulating environment for a species. It has been suggested that an open area should have defined spaces such as pools and rock features as a means to create a sense of the enclosure being larger and aiding in stimulation for the Asian Elephant. The Belfast Zoo also tries to encourage species typical behaviour in their Asian elephants by providing exhibit designs which would be encountered in the wild, for example having trees, slopes, water found in a shallow pool and sandy terrains. It has been noted that bathing pools are common enrichment amenities found in zoos, as they provide the elephants a low-impact exercise as well as the species finding the water enjoyable. Blah (2009) suggested that captive elephants suffer at times life threating foot problems which could be the result of spending more time on hard surfaces than the variety of choices available to them in the wild. The Belfast Zoological Gardens provides its Asian elephants many levels of enrichment, including human related contact by keepers and through medical care. It has been suggested however, that a rotational exhibit design could be used as a means to increase stimulation, such as the one found at ‘Denver Zoo’ which has five distinct areas. The rotational design means that the species can awaken to a new enclosure adding to environmental enrichment. Additionally, the new enclosure will have housed a different species the day before thus the overlapping scents can also provide a level of enrichment especially for the Asian elephants which rely heavily on their senses. Novel objects: various items placed in an animal’s enclosure allow the animal to mimic behaviors exhibited in the wild or could challenge them. These items could include burlap bags, sheets, boomer balls, chew toys, or a hammock. Differences found between the environments of the two species – which one provided better species-typical enrichment – Environmental Enrichment has often been described as a vital role to the daily care and integration of a species. The process of enrichment is dependent on the integration of subcategories, such as how the exhibit is designed, the auditory noises, the scents introduced, food relevance, novel objects, training and research of the animal. The subcategories of environmental enrichment are essential as a means to enhance naturalistic actions, for example, exhibit design needs to provide varying substrates and complexities found in the animal’s natural environment as a means to enhance the species-typical behaviour. Improvements which may need to occur for the animal to have a more productive lifespan – Environmental Enrichment has often been described as a vital role to the daily care and integration of a species. The process of enrichment is dependent on the integration of subcategories, such as how the exhibit is designed, the auditory noises, the scents introduced, food relevance, novel objects, training and research of the animal. The subcategories of environmental enrichment are essential as a means to enhance naturalistic actions, for example, exhibit design needs to provide varying substrates and complexities found in the animal’s natural environment as a means to enhance the species-typical behaviour. Improvements which may need to occur for the animal to have a more productive lifespan – Environmental Enrichment has often been described as a vital role to the daily care and integration of a species. The process of enrichment is dependent on the integration of subcategories, such as how the exhibit is designed, the auditory noises, the scents introduced, food relevance, novel objects, training and research of the animal. The subcategories of environmental enrichment are essential as a means to enhance naturalistic actions, for example, exhibit design needs to provide varying substrates and complexities found in the animal’s natural environment as a means to enhance the species-typical behaviour. provide varying substrates and complexities found in the animal’s natural environment as a means to enhance the species-typical behaviour. CONCLUSION – NOT WRITEN AS OF YET – In conclusion the animals found in the Belfast zoological gardens did demonstrate some species typical behaviours due to the environmental enrichment techniques in place. Environmental Enrichment has often been described as a vital role to the daily care and integration of a species. The process of enrichment is dependent on the integration of subcategories, such as how the exhibit is designed, the auditory noises, the scents introduced, food relevance, novel objects, training and research of the animal. The subcategories of environmental enrichment are essential as a means to enhance naturalistic actions, for example, exhibit design needs to provide varying substrates and complexities found in the animal’s natural environment as a means to enhance the species-typical behaviour (Reference) operant conditioning as a means for animals to engage in. design needs to provide varying substrates and complexities found in the animal’s natural environment as a means to enhance the species-typical behaviour. provide varying substrates and complexities found in the animal’s natural environment as a means to enhance the species-typical behaviour. "Enrichment Issues in Animals: Andean Bear and Asian Elephant." UKEssays.com. 11 2018. All Answers Ltd. 04 2019 <https://www.ukessays.com/essays/environmental-studies/enrichment-issues-animals-andean-bear-asian-5143.php?vref=1>. "Enrichment Issues in Animals: Andean Bear and Asian Elephant." All Answers Ltd. ukessays.com, November 2018. Web. 20 April 2019. <https://www.ukessays.com/essays/environmental-studies/enrichment-issues-animals-andean-bear-asian-5143.php?vref=1>. UKEssays. November 2018. Enrichment Issues in Animals: Andean Bear and Asian Elephant. [online]. Available from: https://www.ukessays.com/essays/environmental-studies/enrichment-issues-animals-andean-bear-asian-5143.php?vref=1 [Accessed 20 April 2019]. UKEssays. Enrichment Issues in Animals: Andean Bear and Asian Elephant [Internet]. November 2018. [Accessed 20 April 2019]; Available from: https://www.ukessays.com/essays/environmental-studies/enrichment-issues-animals-andean-bear-asian-5143.php?vref=1.